Kelly Kunisch was one of two Kentucky bowlers to win gold medals in the singles event on the first day of competition at the Games. 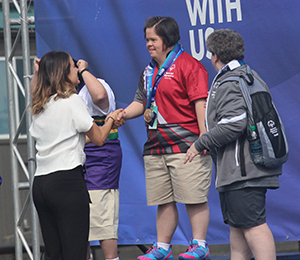 Four Team Kentucky athletes claimed gold medals on the first day of competition at the 2018 Special Olympics USA Games, two each in track and bowling. Joseph Ramirez of Murray claimed the first medal of any kind at these games for Kentucky when he took gold in his division of the 100-meter dash.Ramirez ran a :13.48 to claim first by more than a second over Ethan Brown of New Hampshire. Teron Lewis of Louisiana took the bronze. Ramirez ran the third fastest 100 meters overall at the event. Ramirez was joined by teammate Ryan Barts of Georgetown several heats later. Barts’ medal run was actually his second 100-meter race of the day. He was selected to compete in the first High Performance 100-meter dash in Special Olympics history. A win in the High Performance event would have given Barts the opportunity to qualify for the 2019 World Summer Games in Abu Dhabi. He did not advance to the High Performance final, but cruised to victory in his traditional heat in a time of :13.19. It was the second USA Games 100-meter medal for Barts, who won silver in the event at the 2019 Games in Lincoln, Neb.It was the second USA Games 100-meter medal for Barts, who won silver in the event at the 2010 Games in Lincoln, Neb. Ramirez and Barts were joined atop the medal stand by bowlers Michelle Barnes of Carrollton and Kelly Kunisch of Elizabethtown. Barnes bowled a 290 series to win her division of the same event by 52 pins over Julia Whitesides of North Carolina. Kunisch won her division of the singles competition with a 274 series, winning by 20 pins over Ronnette Rome of Louisiana. Swimmer Cassie Wright of Louisville earned Kentucky’s only other medal on Monday. Wright took silver in her division of the 100-meter individual medley in a time of 2:22.85. She was less than six seconds behind gold medalist Cailynn Goss of Maine. Wright also swam the 200-meter freestyle today, placing fifth in a time of 4:20.53. Two other bowlers and two swimmers competed for medals today. Joseph Jarrell of Olive Hill finished fourth in his division of the bowling singles competition bowling a 202 series. Daniel Williams of Glasgow finished fifth in his division with a 397 series. He was just 14 pins behind bronze medalist Torion Huffman of Louisiana. E.J. Johnson threw for four touchdowns to lead Kentucky over Tennessee. At the pool, Megan McCormick of Lexington placed fifth in her heat of the 100-yard individual medley. McCormick had a great swim in the event, finishing in 1:56.04 and setting a new personal best by eight seconds. Drew Janoski also of Lexington placed fourth in his heat of the 25-yard backstroke, finishing in 1:02.77. 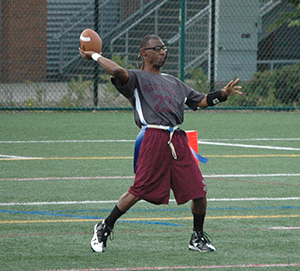 Bocce athletes and the basketball and flag football teams all began pool play today. At the bocce venue, Cindy Cusick of Louisville went 2-0 on the day. Cusick won her first match 8-4 over Rachel Frank of Wisconsin before slipping past Cassandra Mattia of Maine, 9-8. Kathleen Crumbo lost her opener 8-6 in sudden death to April King of Maryland before blanking Stacey Thomas of Alabama 12-0. Brett Thompson of Rockport split his two bocce matches today in the singles competition. He lost his opener to Scot DeWall of Illinois 10-9 before rolling to a 12-2 victory over Marcus Crowder of South Carolina. The Owensboro basketball team representing Team Kentucky coasted to a win in their first game at the 2018 Special Olympics USA Games in Seattle, Wash. Kentucky took a commanding halftime lead and cruised to a 60-16 win. Kentucky was led by Dakota Duvall with 18 points. Walt Drake and Zach Lindsey each had 10. The Bowling Green based flag football team won twice on day one. They took an early lead against Idaho in their morning game and rolled to a 40-20 victory. In their afternoon game, Kentucky found itself trailing Tennessee 13-12 at halftime, and tied at 20 early in the second half. Kentucky outscored Tennessee 24-6 from that point on, behind four touchdown passes from EJ Johnson. David Sexton threw one touchdown pass and scored two more. James Jordan scored three times and had an interception on the first Tennessee drive of the game to lead the win. At the golf course, the Kentucky Unified team of Wake Mullins and Dennis Gaines opened play with an 86, the third lowest score of the day in the 18-hole alternate shot event. Jude Zilliox of Alexandria shot a 54 in the first round of the 9-hole individual stroke play event. All five Kentucky gymnasts will be in action today competing for gold in the all-around. Kentucky will be poised for more medals at the track with Kate Nason of Louisville running the 3,000-meters and Caitlin Roy running the 100-meters in their USA Games debuts. Joseph Ramirez will be back in action running the 200-meters and competing in the shot put. Cindy Cusick will look to keep her record perfect when she competes in the gold medal match in her bocce division. Both Kathleen Crumbo and Brett Thompson will be in the bronze medal matches in their divisions. Michelle Barnes and Kelly Kunisch will be looking for their second gold medals, but will be together this time around as they will compete in the doubles event. Joseph Jarrell and Daniel Williams will also compete as a doubles team. Swimmers Hunter Eudy of Independence and Justin Hale of Louisville will see their first action when they join Cassie Wright and Megan McCormick for the 4×50-yard medley relay preliminary. Basketball and football will both be in action again. Basketball will take on Oregon in their morning game and then face Northern California in the afternoon. Football faces Tennessee again in the morning and Texas in the afternoon.